Nestled in the rolling hills of the UK countryside is a beautiful eighteenth century estate. The estate rests between a couple of old, sturdy trees that stand adjacent to a pond, and the sun sets behind the serene image creating soft hues (Austen 1993). This is the imagery that the reader of Pride and Prejudice by Jane Austen sees as they reach for the Norton Critical Second Edition of the novel. The cover art of a book is a reader’s first indication of what lies in its pages, and the publisher of each edition tailors the cover to market a specific audience. At first glance the cover of this edition does not seem to suggest its content in an obvious way, however the cover subtly allows the reader to note some prevalent motifs that are present in the novel. The characters in Pride and Prejudice are of great importance, however it is the dichotomies between social class, gender, and attitude shown through Lizzy and Mr. Darcy that make the story noteworthy today and these are themes portrayed on the cover of this edition. The grand estate on the front cover of the Norton Critical Edition does suggest that Pride and Prejudice features the theme of money, and more specifically social class. It is true that throughout the novel a number of different estates are mentioned, some are smaller while others are larger and grander. Although the estate on the cover of this edition is clearly very grand, it is small in the scale of the image and is as understated as it could be. 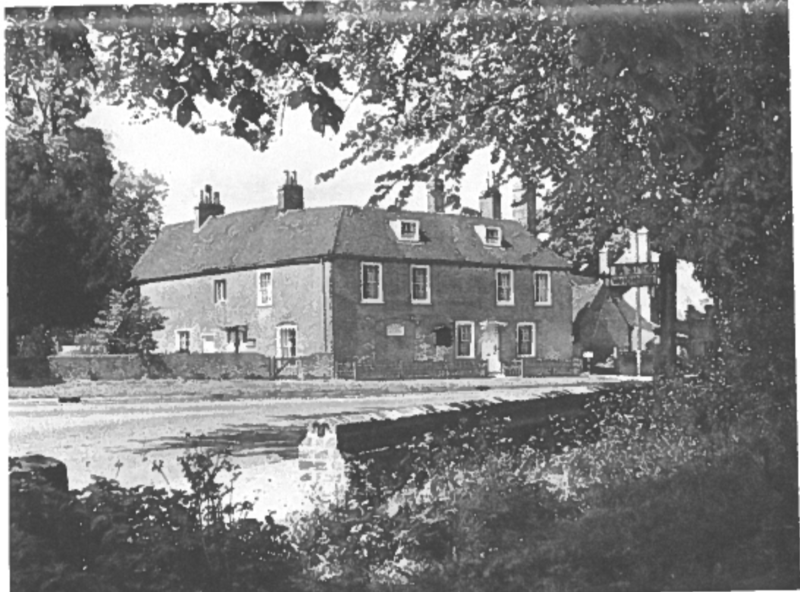 This is representative of the ever-present varying social classes that exist in the novel, and the varying importance placed upon class by each character, for example Lizzy cares not about the status of a person but more so their character, “There certainly was some great mismanagement of those two young men. One has got all the goodness, and the other all the appearance of it” (Austen 155). In this moment Lizzy realizes the truth about two men, and for it her it is of the utmost importance that she can respect an individual for their character, not their status. The estate on the cover of this edition of the novel is shown not once, but twice, in the reflection of the pond that sits in front of the estate. This reflection resembles the balance, yet two-sidedness, of the relationship between Mr. Darcy and Lizzy. In the novel it is evident that Lizzy values finding a partner whom she loves and respects more than she cares about living up to the expectation that she should marry for high status and wealth. In this way Lizzy defies gender roles, and challenges the values of her time. In the end Mr. Darcy levels with Lizzy because he values a woman of intelligence and independence. In realizing that they value one another as individuals a balance is certainly struck between them. In addition to the balance, and even sharing, of some gender roles Lizzy and Mr. Darcy both posses pride and prejudice, Lizzy reflects and realizes she has been both prideful and prejudiced just as she had judged Mr. Darcy to be, “But vanity, not love, has been my folly. Pleased with the preference of one, and offended by the neglect of the other, on the very beginning of our acquaintance, I have courted prepossession and ignorance, and driven reason away, where either were concerned. Till this moment I never knew myself” (Austen 144). The dichotomies of both attitudes are shown through Lizzy and Mr. Darcy throughout the novel, but they each find a way to acknowledge their individual pride and prejudice in the resolution of the novel. The cover of this edition of the novel presents Pride and Prejudice differently than other editions with its heir of historical significance. 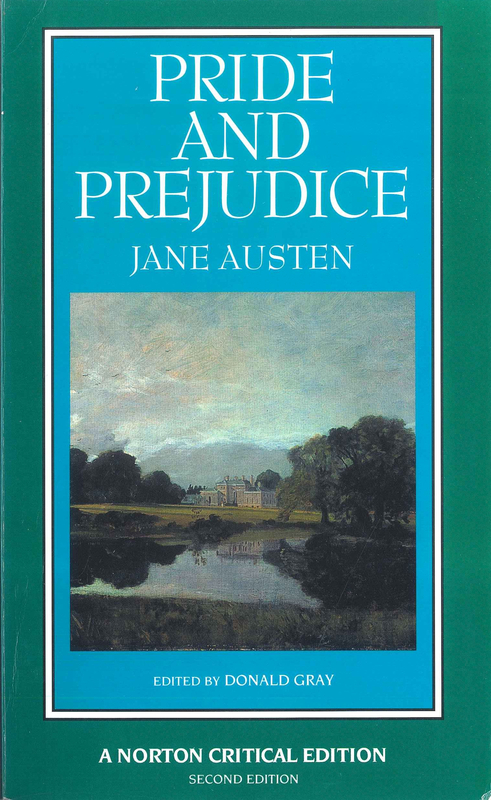 Some cover art of Pride and Prejudice features the characters themselves in an effort to present the contents of the book, some feature shades of red and pink signifying a genre or perhaps appealing to a specific gender more so than another. This edition, however, presents in a way that appeals to any gender because its aim is to attract those interested in visiting another time period in the form of a novel. Even the back cover of this edition points out specific details that would attract a person interested in learning about history, “Backgrounds and Sources includes new biographical portraits of Austen by the people who knew her best – members of her family” (Austen 1993). Perhaps this edition tries to appeal to those interested in historical fiction and period pieces because it is trying to show that the narrative is relevant to an audience that enjoys not only Romance and drama, but that also enjoys glancing back into history. 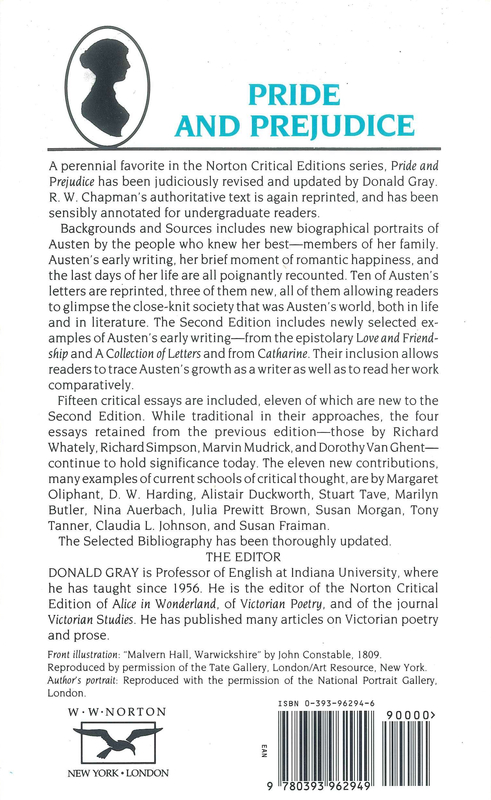 The cover of the Norton Critical Second Edition emphasizes the some of the major themes found within the pages of Pride and Prejudice. Jane Austen’s novels, and Pride and Prejudice in particular, are famous for their ability to connect readers to people in history. The stories highlight undeniable similarities between modern times and the late eighteenth century, as well as the differences, which is what makes them so interesting to read. The cover of the Norton Critical Second Edition invites the reader to enter a world that they do not know, a world of estates and rigid gender roles, yet a world that is entirely imaginable and relatable, of social class and love. The cover art on this edition in particular also shows how diverse the interpretations of the meaning and intent of her work are. Though there are multitudinous editions of Pride and Prejudice today, each of them conveys the content, as well as the deeper meaning within the novel, and so through simple cover art Austen’s work continues to transcend time. Austen, Jane. Pride and Prejudice. Edited by Donald J. Gray and Mary A. Favret, 4th ed., W.W. Norton & Company, 2016. Austen, Jane. Pride and Prejudice. Edited by Donald J. Gray, 2nd ed., W.W. Norton & Company, 1993.